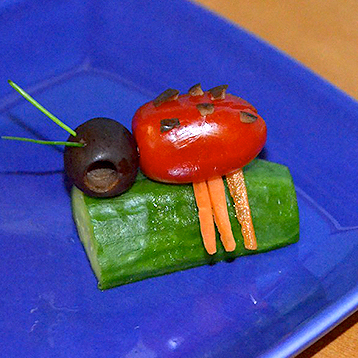 Get your kids to try chives, olives, baby tomatoes, carrots and cucumbers with this sleepy lady bug. Don’t you just want to have a lazy day like this little bug? -But only after a family work-out! You can use cream cheese or a cheese similar to laughing cow to keep veggies in place. Take a picture of your child eating his or her art!